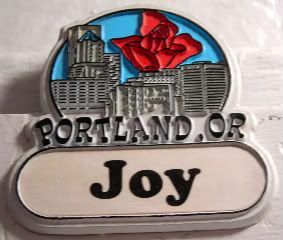 I've been to Portland only once, as part of that cross-country train trip several years ago. It was literally a pitstop of a few hours, before we hooked up with the Cascades line up to Seattle. Two things I remember vividly. Forgetting a stack of my bills on the Amtrak train, freaking out over them, and finding out that the wonderful guys at Amtrak mailed them out for me. Yet another reason to love Amtrak. Love. The other thing I remember is trying to walk up to the Pittock Mansion, "five minutes away" from downtown Portland. Let's just say that the map we were following was most definitely not to scale.